ALL government departments and public institutions seem to have been asked recently to explain their branding, the cost of developing logos and the like. It’s the new vogue in Freedom of Information requests, largely because so much public money is thrust at designers for what those on the outside see as not very much. Like saying which colours look nice. People recognise a great brand by its colour as much as its name. 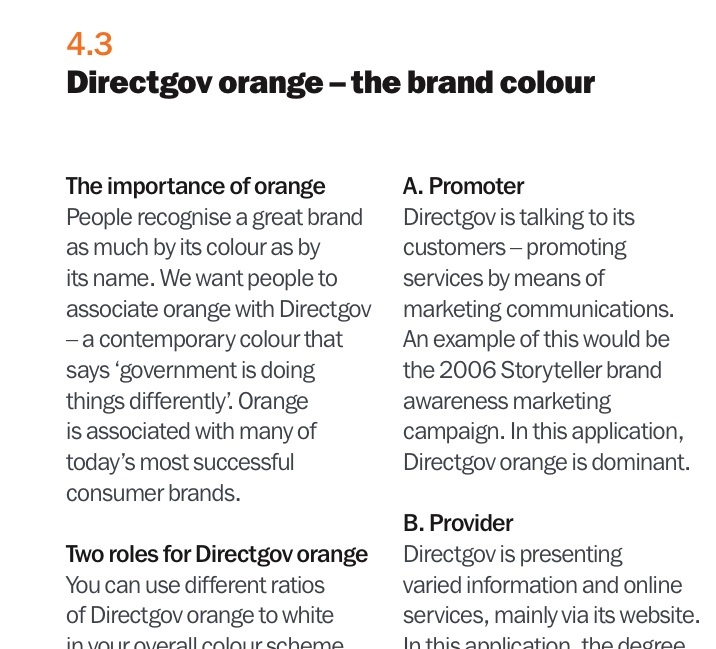 We want people to associate Directgov with orange – ‘a contemporary colour that says the government is doing things differently’. Orange is associated with many of today’s most successful brands. Who knew orange was so persuasive? The logos, the colours, the fonts for DirectGov – I mean Directgov, mustn’t use a capital G for Gov apparently – cost at least £115,000 in April 2004. Industry marketing press suggested that last year another firm was hired in to ‘revamp’ the branding. We’re in the wrong job, people.